The Governor will hold town hall meeting Wednesday in Chesapeake concerning transportation and tax increases for state road and transit projects. Here is a chance to voice your opinion! 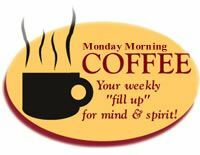 Join us for Monday Morning Coffee!